The Core provides data warehousing services for cancer researchers. 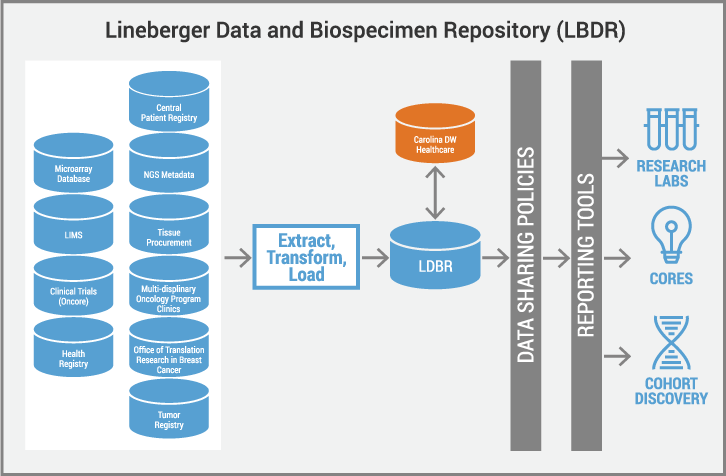 THE LINEBERGER DATA AND BIOSPECIMENS REPOSITORY WAREHOUSE (LDBR) satisfies two primary needs: it helps break down barriers between applications with data that exist in separate systems and it provides a web reporting interface for integrated and operational data reporting. Providing both a platform and custom so ware development through the LDBR project enables research studies to quickly see data results and other LBC services to communicate across organizational lines. Other examples of data integration projects handled by the LDBR include sample tracking across multiple core facilities, loading clinical patient data for internal NEXT GENERATION SEQUENCING, integrating clinical trial study and patient information from Lineberger with UNC Hospital’s Epic EMR system, and making cross-system data linking possible for our supported applications. The data warehouse team also developed so ware that pushes OnCore clinical trials data (both study and patient) into the hospital’s new Epic EMR system so that Lineberger’s clinical trial patients are easily identified in clinical settings. LDBR has integrated data from 10+ research databases across translational research programs from Lab Systems through LIMS, to translational oncology research programs in Breast, Head and Neck, Geriatrics through clinical databases and genomics data generated through high throughput sequencing and microarrays through genomic databases.